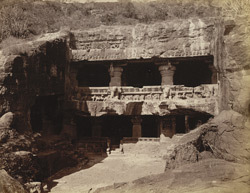 Photograph of the façade of Cave XXXIII, Jagannatha Sabha, at Ellora in Maharashtra, taken by Henry Cousens in the 1870s. Ellora is renowned for its series of Hindu, Buddhist and Jain cave temples excavated into the face of a basalt cliff. Jagannatha Sabha is one of a group of five Jain caves excavated under Rashtrakuta patronage in the 9th century to the north of the site. The façade of this red granite rock cave consists of an architrave supported by heavy columns with cushion capitals and ridged shafts with animal brackets. Inside are sculptured figures of Parasvanath and Mahavira, two of the Jain founders. There are two storeys; the balcony of the upper storey has elephant heads projecting outwards.